You already know I have 3 favorite Christmas challenges, so it isn't much of a stretch to see a Thanksgiving card pop up here. I'll break it to you gently--you'll start seeing Halloween pop up here soon also. When I had my craft booths and was doing craft shows we always sold more Halloween and Christmas goodies in August and September than we did closer to the actual holidays. Ohhhh, don't you just love the holidays, always a good excuse for a party. Yay! This was a great sketch to use Clear Dollar Stamps Designer Dies, and to pleat some ribbon. Pretty papers, some cool brads and just a touch of sewing anchored the whole card together. Can't you just smell the turkey and dressing? 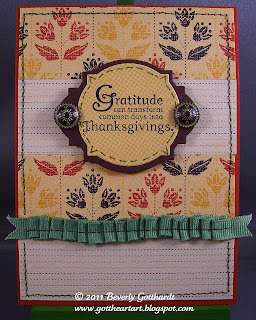 Supplies: Cajun Craze Card Blank 4" X 5 1/2", Papers: SU-Cajun Craze, Specialty Designer Series Paper Autumn Spice, SU-Basic Black, Old Olive marker, Stamps: SU-Day of Gratitude, Clear Dollar Stamps-Designer Dies #170000, SU- Antique brads, sewing machine, SU dimensionals. Ohhh this is so pretty! Thanks for playing in our Thanksgiving challenge at Operation Write Home! Fab job with the sketch, love the papers you used! Thanks for playing along with the Bloggers Challenge!